But the lineup of musicians has changed since then. While Baroque oboist and recorder player Héloise Gaillard and keyboardist Violaine Cochard remain, violinist Gilone Gaubert-Jacques has been replaced by Alice Piérot, and gambist Anne-Marie Lasla by Marianne Muller. The main difference, as I see it, is that the “enlivening zest” has been replaced with a more sober approach to pacing, and greater restraint in ornamentation, despite the continuity factor of Cochard. Tempos are almost exactly alike between Amarillis and Rannou-Balssa-Balssa-Girard (Zig Zag 10301) in the Second and Fifth concerts, for example, but Blandine Rannou arpeggiates chords for rhythmic emphasis in “L’Agaçante,” and delicately ornaments the thematic content of “La Boucon” to emphasize partial and complete cadences, as well as passing dissonances. This has the effect of making phrases sound more supple, without inhibiting forward movement. Cochard does none of this. Both musicians stick close to Rameau’s table of ornamentation, but Rannou goes beyond the strict reproduction of embellishments as published. From a period when the score was expected with few exceptions to be treated flexibly, this would not be uncommon; and as Marpurg sensibly wrote about the art of ornamentation in 1756, “It is impossible to devise rules to meet all possible cases so long as music remains an inexhaustible ocean of options.” To me, Amarillis seems cool, proper, and slightly stiff, while the musicians on Zig Zag perform more warmly and intimately. Slower pacing has more of an effect in Le berger fidèle. Marc Minkowski uses the orchestral version of the score (Archiv 449 211-2), but his Les Musiciens du Louvre achieve a light effect, and a greater diversity of basic tempos to suit the expressive variety of the pastoral cantata. Where Amarillis chugs along in “L’amour qui règne dans votre âme” at 96 bpm, Minkowski’s 110 bpm seems more appropriate to something so joyous and carefree. Slower tempo airs are more similar, though in the plaintive air, “Faut-il qu’Amarallis périsse,” we actually find Amarillis pushing faster than Minkowski’s 58 bpm. 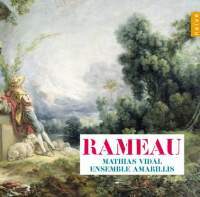 Both albums are blessed with excellent singers: Veronique Gens for Minkowski, and Mathias Vidal for Amarillis. I wrote of Vidal in Campra’s Le carnaval de Venise (Fanfare 35:3) that he lacked the free-throated high tenor sound of Aaron Sheehan, but possessed excellent facility; and so he does here, along with a fine sense of style. But the engineering does him an unkindness, putting him at some distance from the microphone and draining his voice of its upper partials. By contrast, Gens is recorded closely but without exaggeration, and the lyrical warmth of her voice comes through. But you get the idea. Whether or not we agree on the issue of free ornamentation, Amarillis is too inexpressive in the cantatas, and the sound leeches Vidal’s contribution of much of its effect. My recommendations remain with Rannou-Balssa-Balssa-Girard (Zig Zag 10301) in the Concerts, Minkowski (Archiv 449 211-2) in Le berger fidèle, and honey-voiced Cyril Auvity in Orphée (Zig Zag 71002).